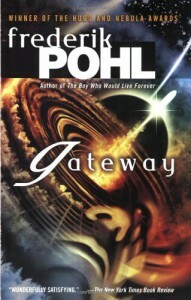 Pohl won a Hugo and a Nebula for Gateway, deservedly so.Frederik Pohl was, of course, one of the Golden Age writers of SF. 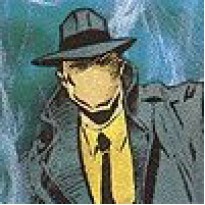 But Gateway showed that he was hardly stuck in the 1950s. It was very innovative for its time. The general tone is quite modern. Much of the book is about the therapy of Robinette Broadhead, an ex-astronaut with severe post-traumatic stress disorder. The PTSD is understandable, since his spaceflights were taken in several alien spacecraft that no one knew how to operate; operating out of an abandoned alien base in the solar system, the "prospectors" of Gateway faced an extremely high casualty rate.Robinette Broadhead is a complex character; unpleasant in some ways, and often not admirable. But since the story is told from his point of view, in first person, it's clear that we're not getting an objective picture of himself or, probably, his experiences.Pohl also put whole-page inserts in the book, including conversational program read-outs from Robinette's therapist (a computer program), excerpts from science lectures, classified ads, and letters - all of them relevant to the story, of course, and many of them quite funny. The novel itself is not a comedy, I should note, but there are many very amusing moments.I'll also quickly note that Pohl's representation of future society is dystopian and rather prescient. Desperate poverty is, apparently, the norm for most of the world's population. People sell organs and body parts to the rich in order to survive. Much of the environment is hideously despoiled, although there are domed enclaves where the elite live. Health care is more than ever a matter of life and death, priced beyond the ability of most to pay; but for the wealthy, life is comfortable and long. A look at current health care statistics makes the world of Gateway seem not very unlikely. Except that we're unlikely to find an alien base with FTL spacecraft in nearby space, of course.The ending is rather touching. No spoilers, but one of the strongest and most likable characters in the book is Robinette's therapist; I've always found his final remark oddly moving. It's a pity that he (it) wasn't given more of a role in the sequels.